We watch a lot of TV – some of it good and some of it…not so good. For the 2013 pilot season, we’re checking out a few series we won’t be writing on regularly, but may check back on throughout the season. Next on the docket: the second season premiere of CBS’ Elementary. I’ve always had a bit of a love/hate relationship with Elementary. Comparisons to the far superior BBC version were inevitable when the CBS semi-procedural clone debuted last year, and it’s hard not to admit that the American version didn’t pale in comparison, despite engaging performances by leads Johnny Lee Miller and Lucy Liu. If we’re being honest, the biggest issues had nothing to do with either protagonist. It was the show beyond these two Holmes mainstays that suffered: the police bordered on inept, the secondary cast were little more than cardboard cut-outs and many of the cases were far too obvious. The season picked up dramatically in its final episodes, however, as the show again complicated the Holmes mythology by making Moriarty and Irene Sadler the same person (see TVAngie’s take here and here). With that move, and a great turn by guest star Natalie Dormer, things looked rosy as the series headed into the summer hiatus. So I was interested to see if Elementary would fall back on its early structure/pitfalls. Unfortunately it appears that the answer is yes. Both “new” characters that are introduced in this London-set adventure – Detective Lestrade (Sean Pertwee) and Sherlock’s brother, Mycroft (Rhys Ifans) – are given far too little screen time in favour of an open and shut generic case that fails to engage (3D printing guns! How very last year!). Considering how much could have been done to flesh out Sherlock’s past, and reiterate how significant with Watson is, this should have played out as a much more significant chapter for the series. Instead it feels flat, as though this was just another week of the show. I mean, you’re going to take the time to shoot in London and instead of using it, you focus on a stupid spousal murder?! It boggles my mind. If something does succeed, it’s that change of scenery. There’s an authenticity to actually shooting in the UK at a variety of famous and not-so-famous locations that gives even some of the more exposition heavy (read: boring) scenes a little extra kick (I was partial to the demolished opera house Lestrade is hiding out in). Now if only the narrative that was crafted around these landmarks were are interesting to watch. Instead it just seems as though Elementary thought a destination episode would merit attention simply because the action has been moved out of NY. Alas this not the case. At the end of the day Elementary is a very confident show – it knows what it is and who its audience is. I’ve never been able to forgive it for resting on its laurels, but I accept that those who like it, like it quite a bit. That doesn’t make TVAngie or I want to cover it on a weekly basis, however, so for now it’s on to greener pastures and should Lestrade, Mycroft or Moriarty/Irene turn back up, we’ll be sure to check back in. Elementary closes its freshman season with a two-hour, explosive finale where we not only get the return of Irene Adler (Natalie Dormer) but also find out the identity of the infamous Moriarty. Sherlock (Jonny Lee Miller) is desperate for answers as Moriarty continues to play mind games on this week’s Elementary. Does Holmes get any closer to the answers he seeks? The hunt for Moriarty finally continues this week on Elementary, which also means we get the return of Sebastian Moran (played by the superb Vinnie Jones). Does this week’s episode live up to its title? 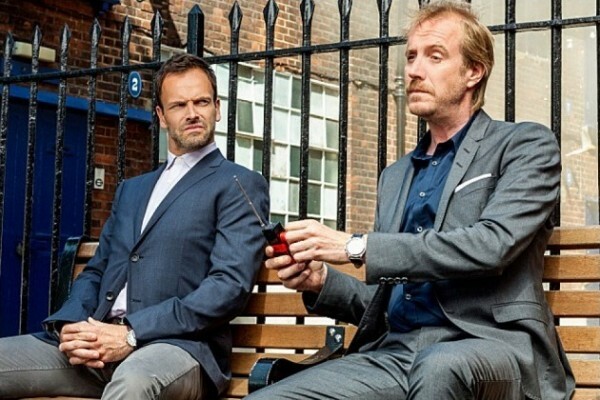 Elementary returns from few weeks of re-runs with another case-of-the-week and the ‘celebration’ of Sherlock’s (Jonny Lee Miller) one-year sober anniversary. As we approach the end of this first season, how did this episode fare?